It’s just another picture-perfect day in downtown San Mateo, California, a city that walks the line between high-tech polish and down-home simplicity tucked between San Francisco and the heart of Silicon Valley. “When you’re starting a business, you have to take that first step,” venture capitalist Tim Draper (MBA 1984) tells 30 students assembled poolside at Draper University, a seven-week entrepreneurship boot camp targeting 18- to 28-year-olds that he launched in 2012 after purchasing and renovating the vintage 1926 Benjamin Franklin Hotel (once host to Ginger Rogers). “So I want everyone to take that first step.” Then one of the most successful investors in Silicon Valley—all 6'4" of him—plunges into the water clothed in suit and tie. The students follow hesitantly, until the water is teeming with hooting 20-somethings hoping to become the next Mark Zuckerberg. “I want nothing to hold you back from what you want to become,” Draper tells them earnestly, his hair plastered around his face. That’s a scene from the first episode of Startup U, a reality TV show on ABC Family that follows 10 DU students through the ups and downs of refining their business plans as they prepare to pitch a room full of VCs, Draper included. Students also test their mettle by breaking boards with their bare hands, building boats, and competing in paintball. The residential program, which has included visits from entrepreneurs such as Rent the Runway’s Jennifer Hyman (MBA 2009), Zappos CEO Tony Hsieh, and Lyft founder John Zimmer, centers around a team-based curriculum. To date, DU has nearly 500 alumni from 50 countries, with more than 250 startups created, including a medical device company, an apartment listings app, and an exchange for users to sell their online data. A room-filling presence, from his broad-shouldered frame to his toothy grin and exuberant eyebrows, Draper embraces feats of physicality. Video clips show the 57-year-old dancing wildly to Pharrell Williams’s “Happy” or publicly performing his signature song, “The Risk Master” (often off-key). In a getting-to-know-you session for Startup U, he even gives twerking a try. “I want to put the students in weird, embarrassing situations,” he says, “so I lead by example.” Entrepreneurship requires the confidence to step away from the safety of the pack and try something new, he reasons—so why not jump-start that mindset by throwing your body ahead of your inhibitions? Looking goofy doesn’t matter. Your ideas matter. Action matters. Investing in change matters. Plus, swinging from the ceiling with professional acrobats, dressing up as a clown, and skiing through a blizzard in boxer shorts is just plain fun. 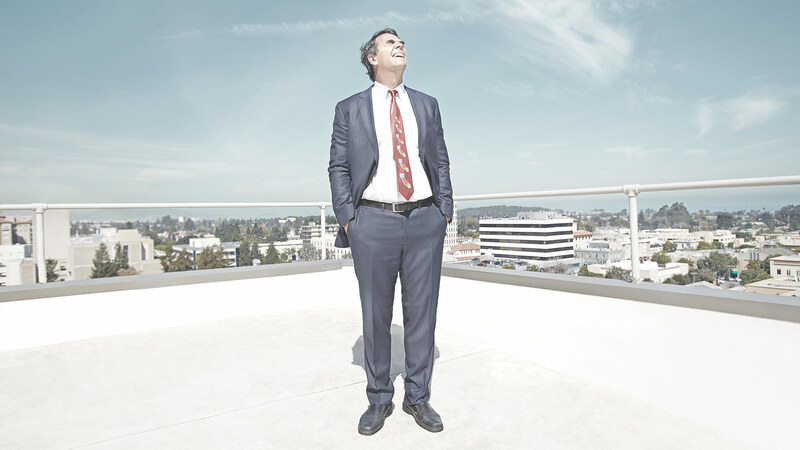 It’s part of who Tim Draper is, the same part that sees opportunities others might miss and finds nothing unusual or scary about taking on established norms. 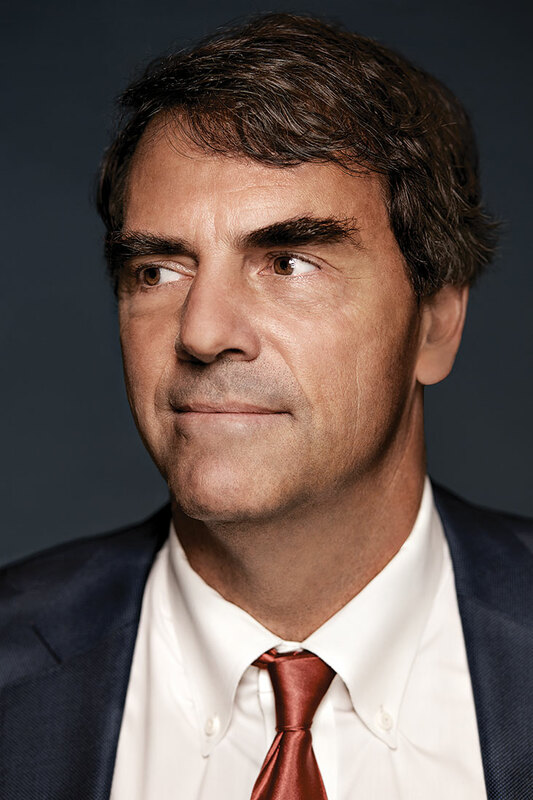 For the moment, however, Draper is tethered to a conference room chair in the Menlo Park office of DFJ (formerly Draper Fisher Jurvetson), the venture capital firm he founded in 1985 as a small business investment company called Draper Associates. Conventionally dressed, his tie nonetheless depicts a map of California divided into six states, a cause he campaigned for vigorously (more on this later). A third-generation venture capitalist, Draper is the grandson of General William H. Draper, who founded Silicon Valley’s first VC firm in 1958, and the son of Bill Draper (MBA 1954), who founded Draper & Johnson Investment Company in 1962 with Franklin “Pitch” Johnson (MBA 1952). That doesn’t mean Draper doesn’t make pointed observations or ask the hard questions of hopeful entrepreneurs. “I want you to think about whether you really are an entrepreneur,” he says to a young woman who hopes to launch a mirror makeup app using facial recognition technology. And when pitch day comes, the level of rigor can be surprising to some. “He asked tough questions, even hardware-related stuff,” DU alum Surbhi Sarna told Bloomberg Business last year. “...He was giving us design ideas.” Draper invested in Sarna’s nVision Medical, a medical device company for women’s health issues; he backs about 25 percent of DU student ventures overall. All told, Draper guesses he’s listened to about 100,000 pitches over the years. “When I meet entrepreneurs, I always think they’re going to be hugely successful, but I’m an optimist. In fact, I’m wrong more than I’m right. What I do understand is how big something can get.” This last comment is spoken in an offhand way, but that ability to understand how a business will scale has been a key factor in some of DFJ’s enormous multiple returns. Today, DFJ spans affiliate networks in more than 30 cities around the world with over $7 billion in capital commitments, including funds focused on seed, early, and growth stages. And sometimes, they’re doing it because they see an opportunity that their employer doesn’t. Draper followed the development of peer-to-peer file-sharing technology and tracked down the founders of Kazaa who had left to start a shared wireless Internet company. Another investment resulted from a test-drive of an electric car: “It took off like a rocket and stopped on a dime,” says Draper. That eventually led DFJ to Elon Musk’s Tesla Motors, then SpaceX, the rocket manufacturer founded by Musk in 2002 with the modest goal of “enabling people to live on other planets.” In Draper’s eyes, Musk and others like him are heroes, plain and simple, because they have the capacity to change the world for the better. “Tim recognizes the difficulty of effecting change, and the need to celebrate the people who do that work,” says Jennifer Fonstad (MBA 1997), a managing director at DFJ for 17 years who has since cofounded Aspect Ventures. Draper believes in the entrepreneur-as-hero concept so literally that visitors to Hero City, the incubator directly across the street from Draper University, will find a 50-foot-wide mural of Batman, Robin, Wonder Woman, and Superman, with a mini-army of entrepreneurs and construction-hatted worker-bees lined up behind them. There’s even an image of Draper himself peeling back his shirt to reveal DU’s shield logo—which looks an awful lot like the “D” version of Superman’s “S” if you look at it the right way. Maybe Draper’s antics could cause entrepreneurs to think twice about hitching their wagon to DFJ. But there’s strategic value to standing in a fountain for a company report photo shoot for the simple fact that it gets you noticed in a very crowded, loud world. “You’ve got to get above the noise level,” says Paul Maeder (MBA 1984), a founding partner at Highland Capital Partners. “Maybe some entrepreneurs won’t think he’s serious. So what? He could care less. Some people might say that dividing California into six states qualifies as one of those wild schemes. In December 2013, Draper petitioned the state’s attorney general for permission to collect signatures for the measure to be placed on the 2016 ballot, but by September 2014 the 752,685 validated signatures out of about 1.1 million collected (the validation process is one Draper would like to debate) fell short of the required 807,615, despite a reported personal investment of $5.2 million. While California is still very much one state, Draper, undaunted, has since launched Innovate Your State, a nonprofit dedicated to boosting public participation in initiatives to improve government. Its first effort, the Fix California Challenge, crowdsourced ideas for ways to improve state government, resulting in 426 proposals winnowed down to two winners. The first would create six “megacounties” for the entire state, each with its own school district, water district, and other services; the second, known as the California Legislature Transparency Act, would mandate increased levels of government transparency by strengthening public access to the legislative process. Both can seek support from a select group of investors to help enact the proposals as law. This and Draper’s six-state push are not even his first forays into the public sector. After pulling his children from public schools, he served on California’s State Board of Education for a year to see if he could help make improvements to the system. Instead, he began to lose faith in it. In 2000, he spent a reported $23.4 million in support of a statewide school voucher initiative that ultimately met with defeat at the polls. He can keep investing, too. While he no longer devotes time to DFJ’s early-stage venture fund, he has already backed two startups through Innovate Your State. Placeavote, for example, is a digital voting platform that allows citizens to debate and vote on every issue before Congress. The votes are then proxied through a congressperson who has pledged to vote according to what the district majority says on the platform. Another venture, OpenGov, is a cloud-based technology solution that makes it easier for government officials to analyze financial data and create budgets; it also offers a public interface that opens a government’s books to its constituents. “If you want to see how much money your community spends on police, you can track that, down to the flak jackets, canine unit, and pensions,” he says. Ultimately, Draper hopes that these and other ventures will move the needle on the dual purpose of effecting change and making a good return. In the meantime, he will continue to focus on what he does best-looking to the future, thinking big, and prodding the rest of us to step out of our comfort zones.